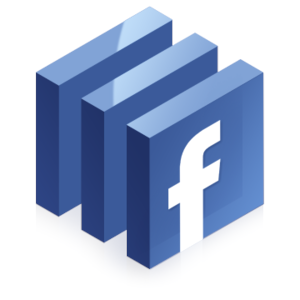 Today we know facebook is one of the effective platform for marketing and advertising. Every website wants to get connect with facebook and get their potential customers. Now facebook advertisement leaves all other advertisers and publishers behind and has become one of the most successful advertisement arena. Facebook is going after brand advertisers as their primary revenue channel, hoping to take dollars away from television advertisers as their share of the attention economy continues to increase. 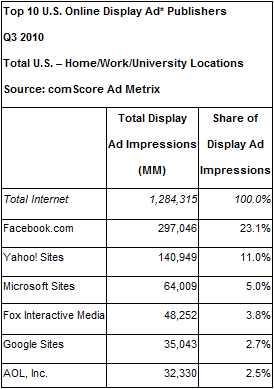 It appears that the strategy is a smart one as Facebook now accounts for 23 percent of all ad impressions in the United States. Contrast that with Google who accounts for 2.3 percent of impressions. This was a strategy highlighted by Fred Vogelstein’s 2009 article about the “Great Wall Of Facebook“. The company has been incredibly effective at driving attention to their site, with users spending hours on the site every month. For Facebook that attention has translated into impressions, many of which still haven’t been monetized (there is plenty of unfilled homepage inventory). While Facebook’s self-serve advertising platform has produced tremendous results, the company is still at the very beginning of their push for brand advertisers. With numbers like the one’s published by comScore today, there’s no doubt that the company should have no problem in attracting those advertisers as they now own one quarter of the impressions in the U.S.